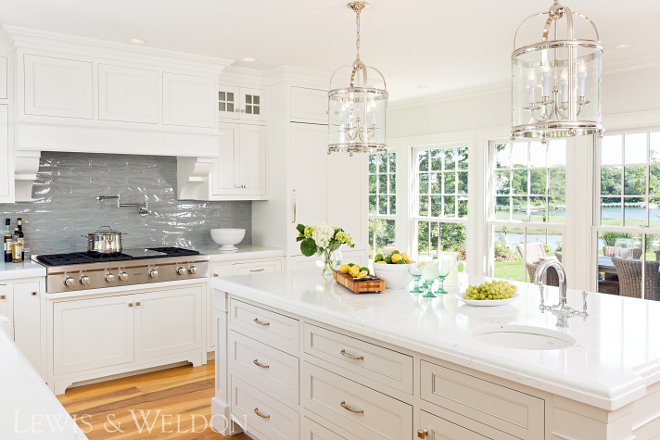 Designed by Lewis & Weldon Custom Kitchens, the goal for this remodel was to design a kitchen that would reflect its Cape Cod setting and appear as though it had always been a part of the original house which was built in 1892. 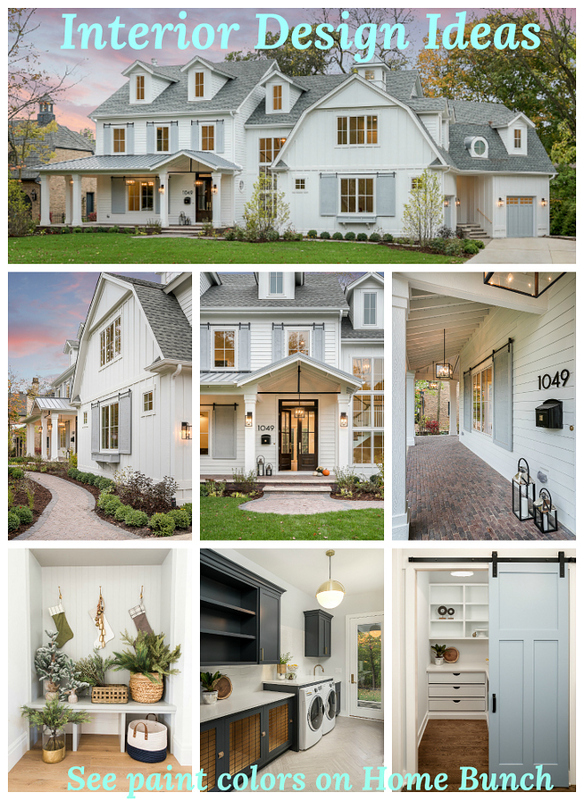 The client wanted to maintain the history and the architecture of the house while designing a kitchen that is large and welcoming, and with modern amenities. 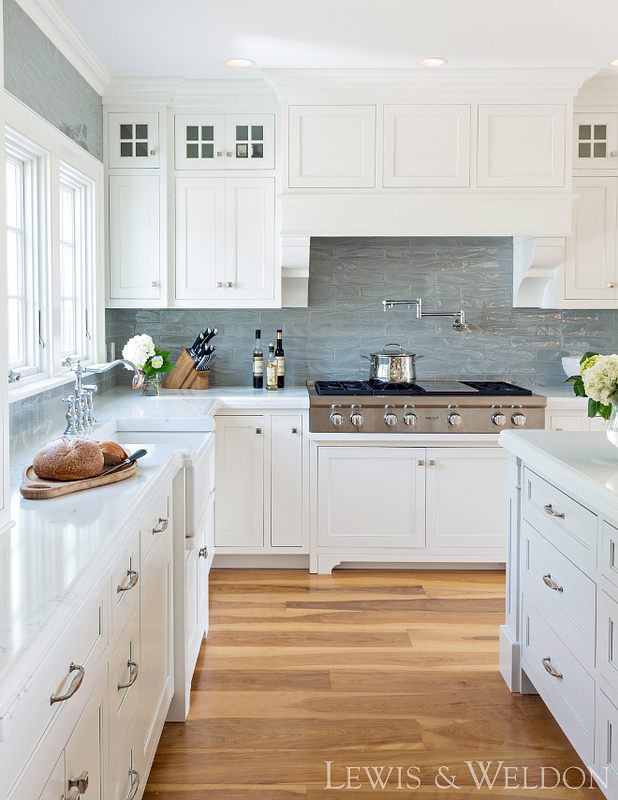 The kitchen, measuring only 19 feet in width from front to back, could not be expanded beyond the original footprint because of its proximity to Herring River, but the homeowners have a large extended family and enjoy hosting parties so they needed to create some flexibility in the space. 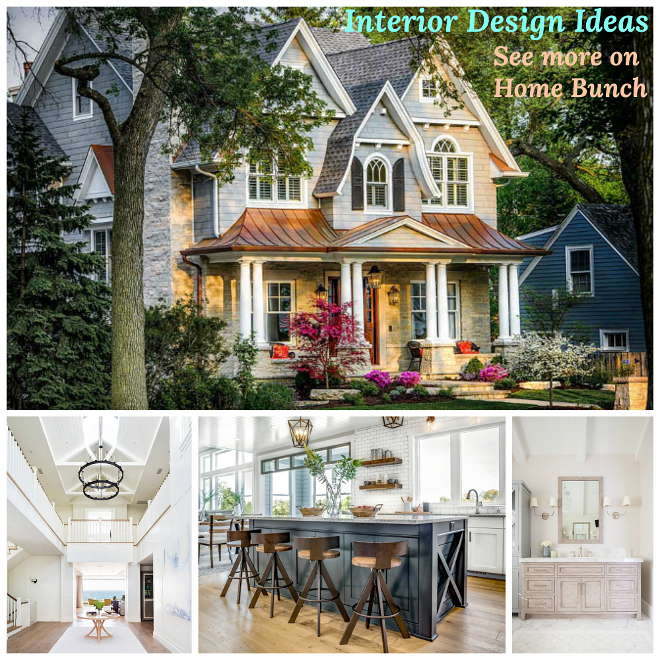 Read on to know how the designer accommodated the clients’ needs. 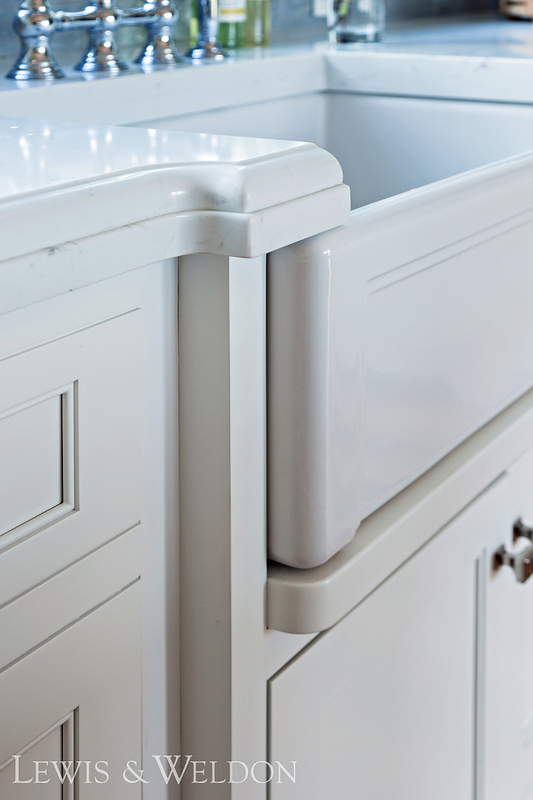 Kitchen Cabinet Details – Custom inset cabinetry with recessed panel, with inside bead detail. Perimeter cabinets are Maple painted Benjamin Moore White Dove. Kitchen Island – Custom inset cabinetry with recessed panel, beveled inside bead detail – Maple painted Farrow and Ball Cornforth. Lighting – Visual Comfort (discontinued) – similar here. Grey Backsplash Tile – Tile Bar Santa Monica Gray 4×12 Tile. Cooktop –48″ Wolf Range Top. 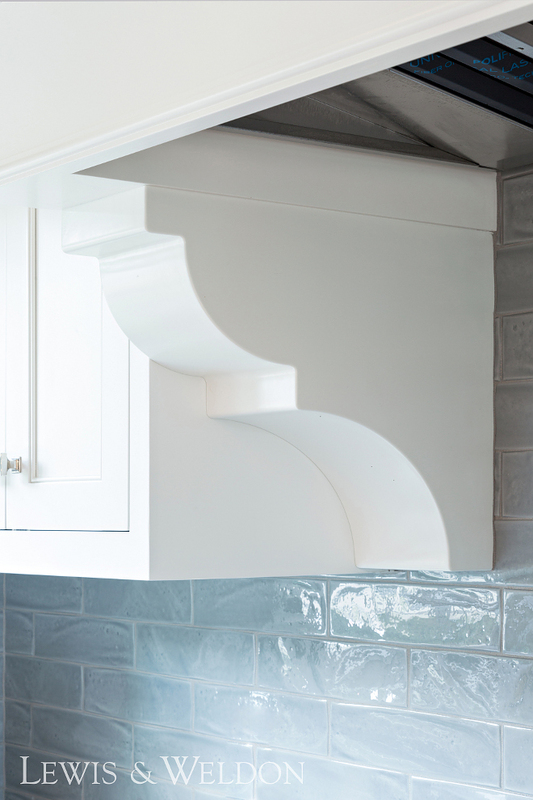 Custom corbels flank a range top hood designed by Lewis & Weldon. 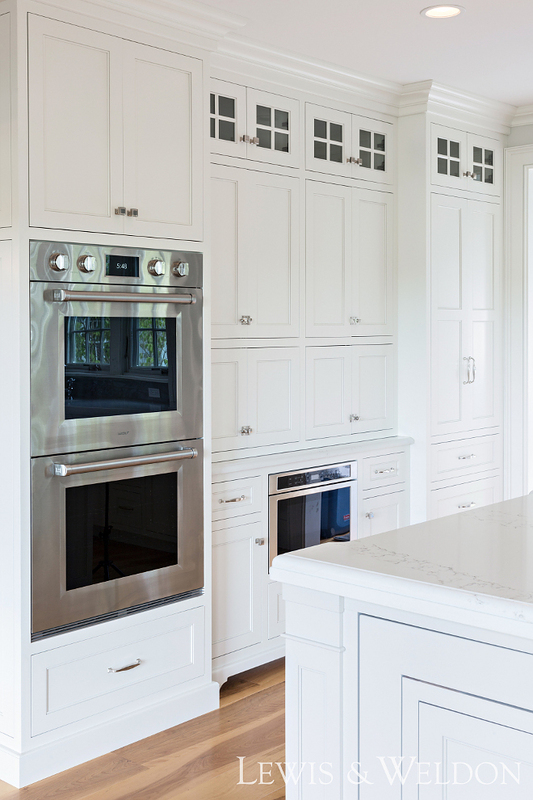 Countertops – 2 1/2” thick Pental Quartz, Statuario; edge detail is Dupont over Eased. Dimension – 98” wide x 52” deep. 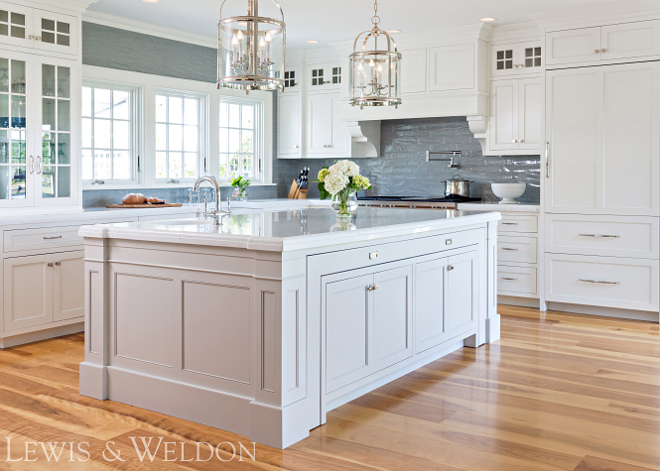 Lewis & Weldon Custom Kitchens designed this Pull-out table to maximize use of limited space in kitchen. The table pull out measures 80” wide x 28” deep. Custom legs features hidden casters for easy roll out and the custom-designed table slides out from inside the center island easily. The pull-out table can also be used as an additional space for placing food and beverages during large gatherings and then be completely concealed during quiet times. The lack of storage, due to the restricted space, was another issue that needed to be addressed. The answer was numerous built-ins and various nooks to provide additional storage options. 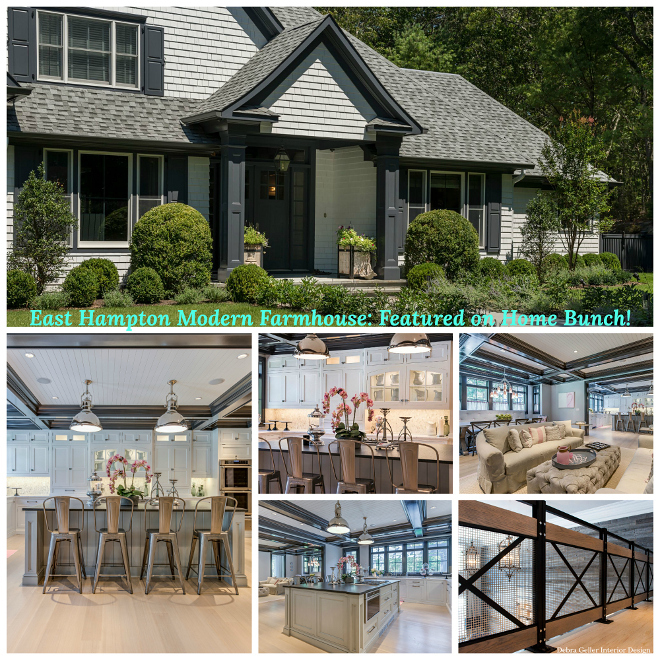 Appliances – 36″ Sub Zero Built In Fridge, 24” Paneled Miele Dishwasher, 30” Wolf Professional Built-In Double Ovens, 24” Thermador Micro Drawer. Kitchen Walls – Benjamin Moore OC 20 Pale Oak – Trim – Benjamin Moore White Dove. 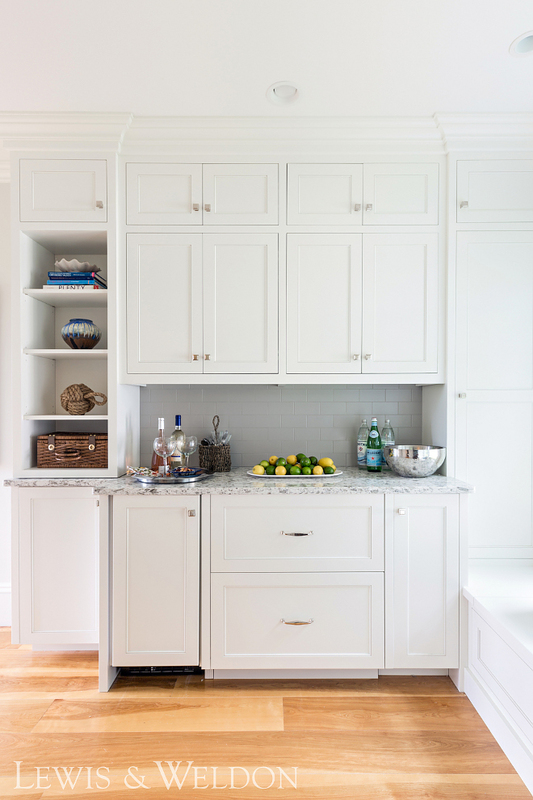 The butler’s pantry features custom inset cabinetry with recessed panel, with inside bead detail, painted in Benjamin Moore White Dove. 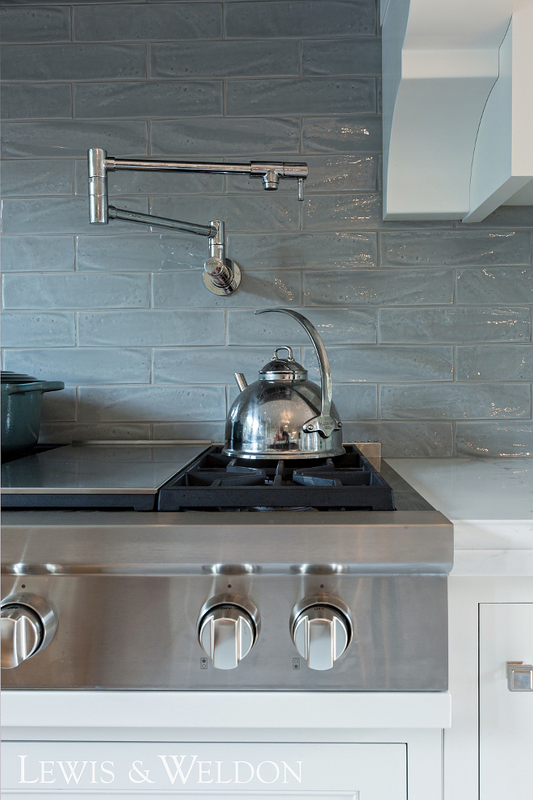 Backsplash Tile – Galleria Tile 3” x 6” Subway Tile “Streamline” Collection, color is Dorian. 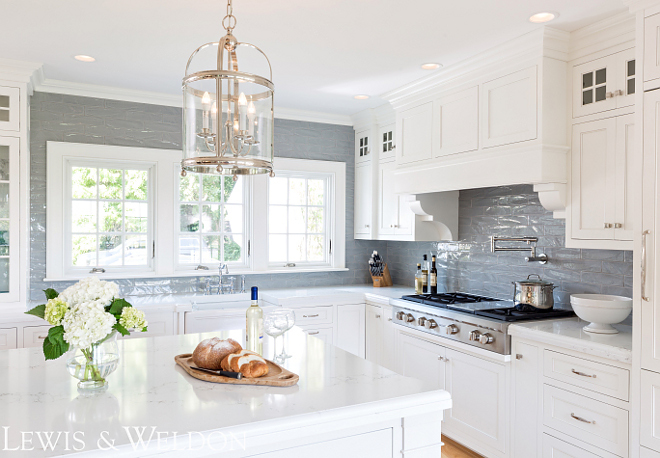 Appliances – 15” Paneled Jenn-Air Ice Maker, 30” Paneled Sub Zero Fridge Drawers, custom panels by Lewis & Weldon. Coffee maker, toaster and bar area are concealed by cabinet doors. 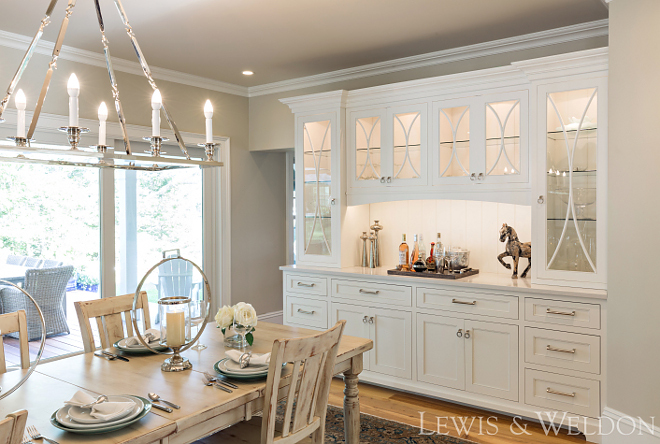 The dining room features custom inset cabinetry with recessed panel, with inside bead detail. Mullion design is custom as well. 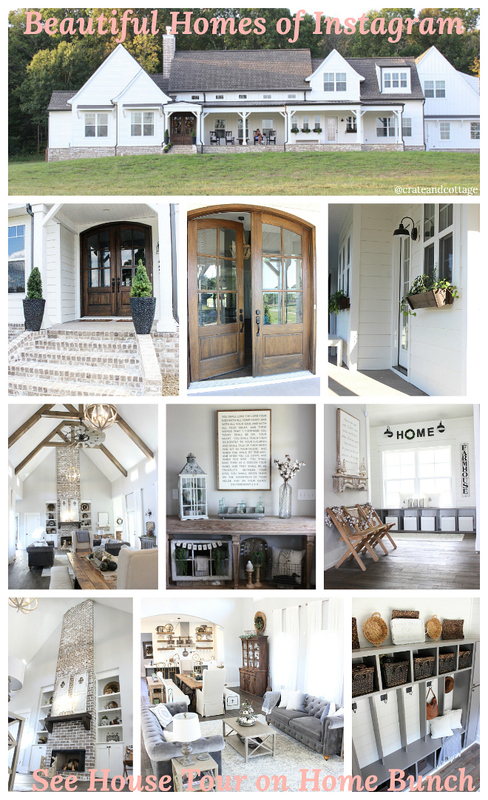 Paint color is Benjamin Moore White Dove. Cabinet Hardware – By Alno in polished Nickel—1 ½” Ring pull & “Circa” handles also by Alno. Paint: Walls – Benjamin Moore, OC 20 Pale Oak. 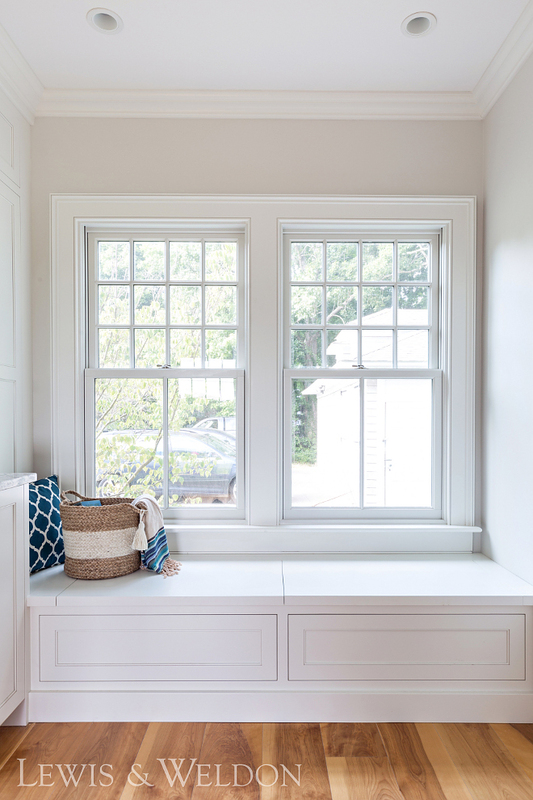 Trim – Benjamin Moore White Dove. 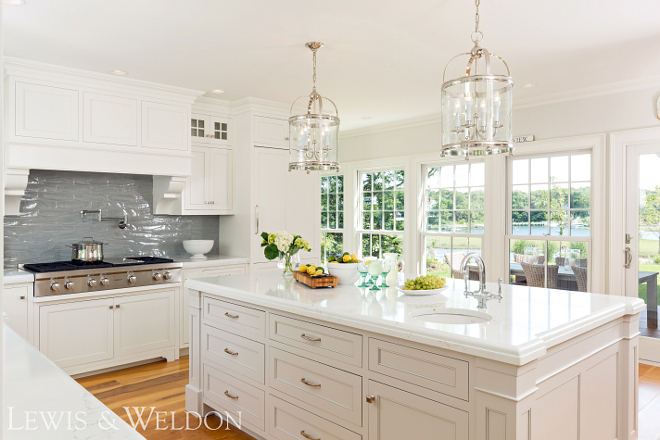 Interiors: Lewis & Weldon Custom Kitchens. 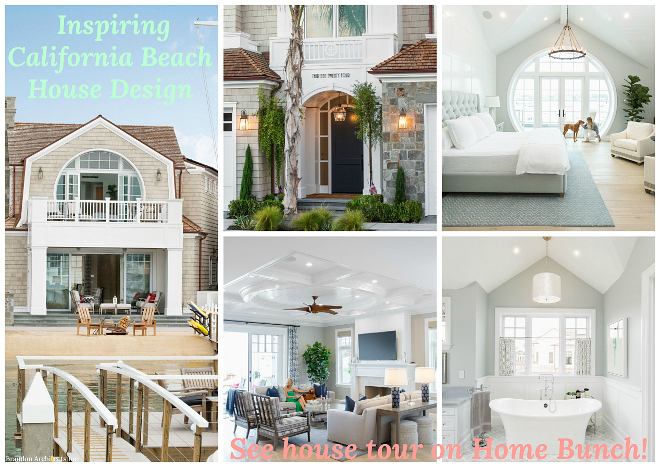 Classic Shingle Home Design Ideas. 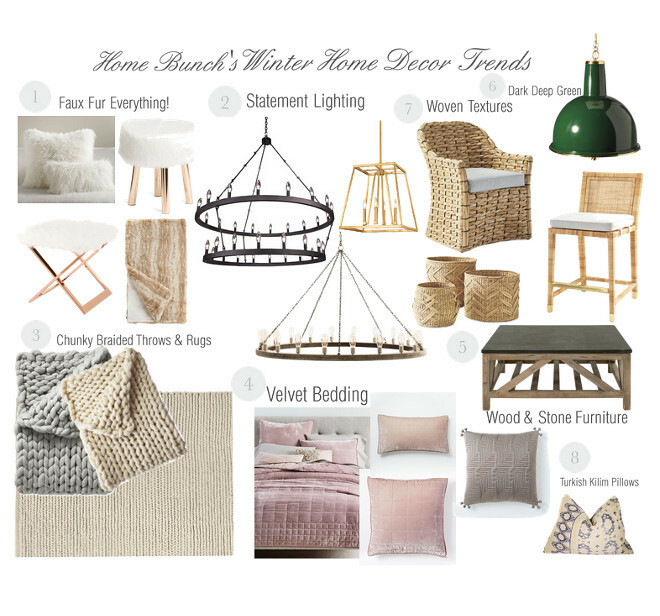 California Modern Farmhouse Beach House.